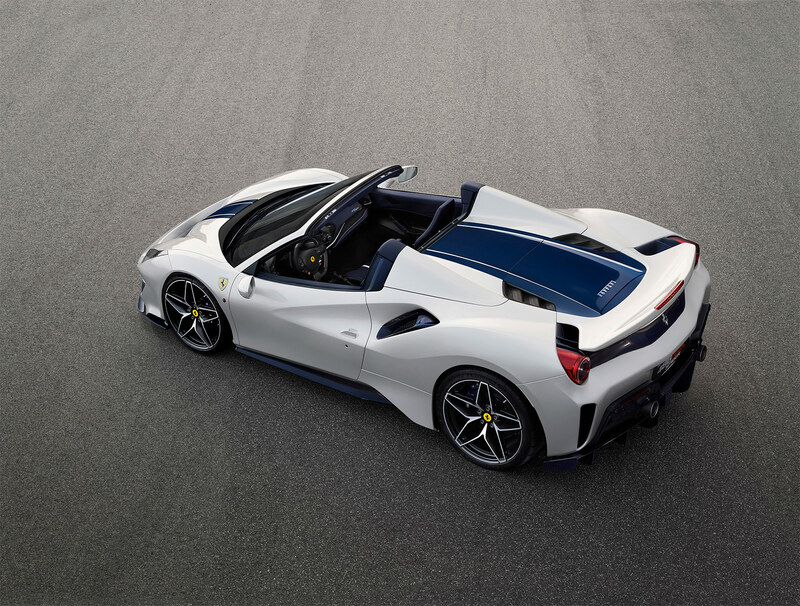 The 488 Pista Spider sets a new benchmark for Ferrari for spider performance with an unprecedented weight-power ratio, a result made possible by the adoption of the most powerful Ferrari V8 engine ever. The 3902 cc twin-turbo V8 unleashes 710 hp at 8000 rpm and 568 lb-ft of torque at 3000 rpm. 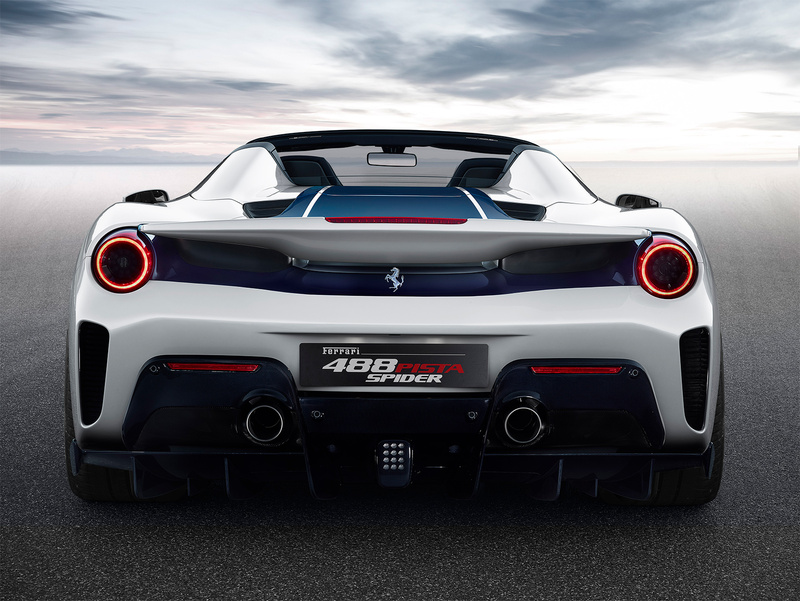 All of this power and torque will launch the 3042 pound 488 Pista Spider form 0-100 km/h in just 2.85 seconds, from 0 -200 km/h in just 8 seconds and has a maximum speed of 340 km/h. 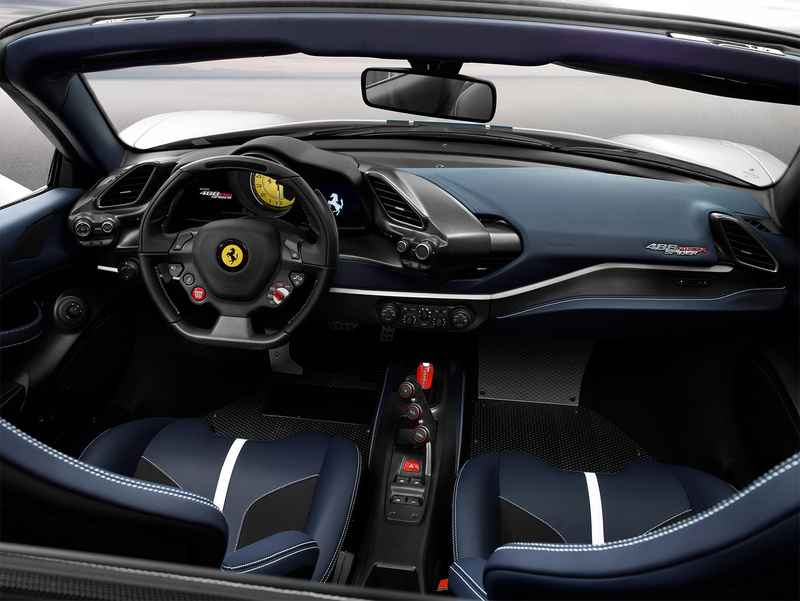 The unique engine sound is now even more impactful thanks to the open-top car configuration. 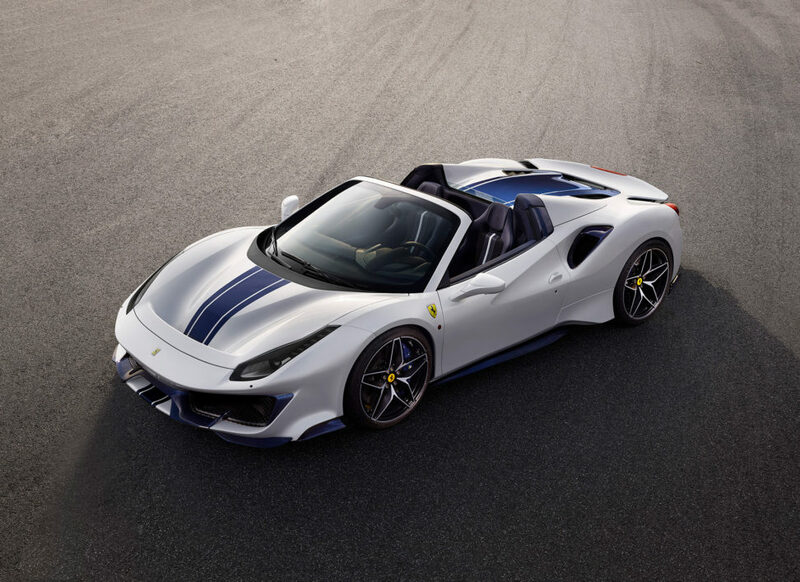 The Ferrari 488 Pista Spider is directly derived from the 488 Pista which encapsulates all the racing experience gathered on world’s circuits with the 488 Challenge and the 488 GTE. 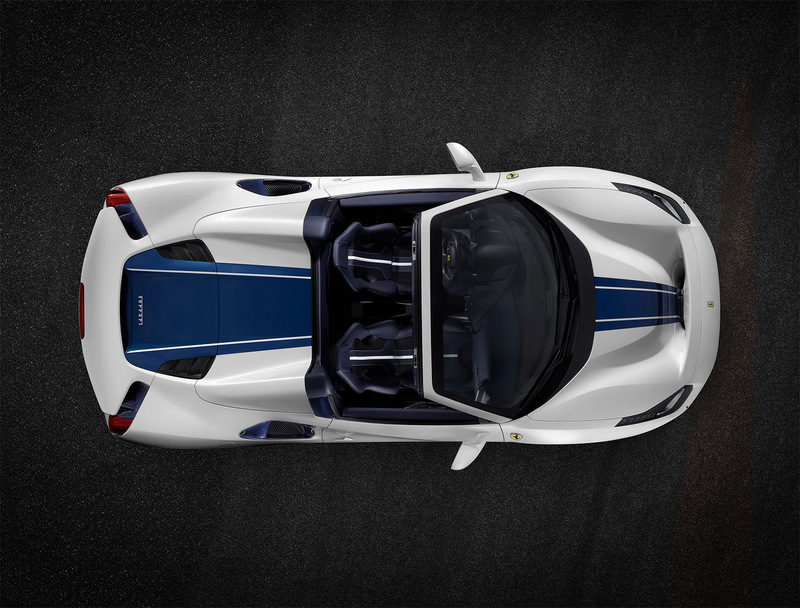 As a result, the new Spider offers the highest level yet of technological transfer from the track to a road-legal drop-top car. 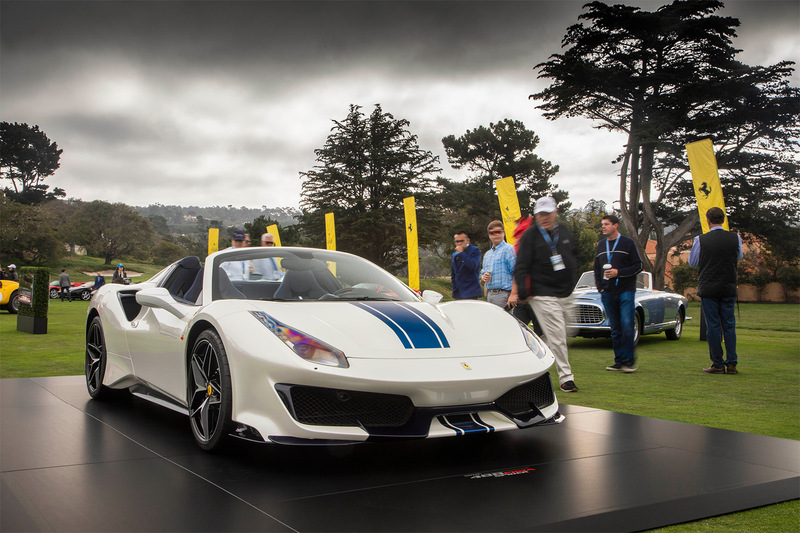 The Ferrari 488 Pista Spider represents the natural development of the defining design of the coupé version. 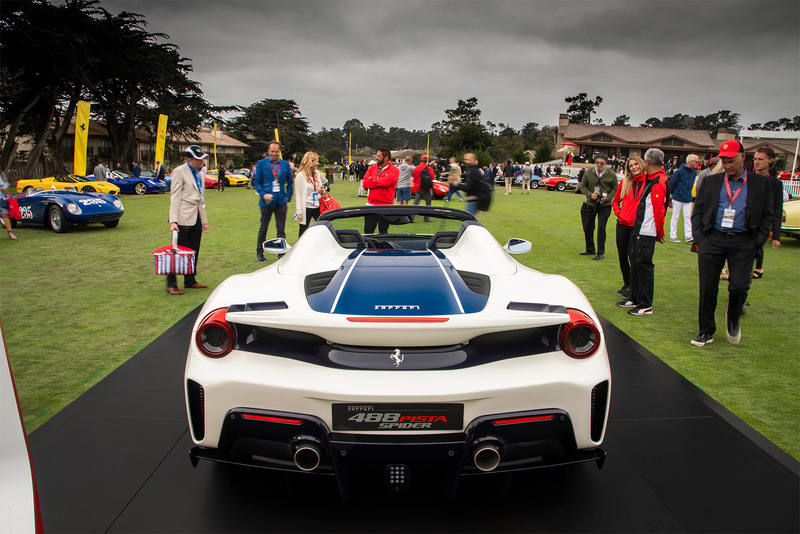 The Ferrari designers’ primary objective was to maintain unaltered the perfect marriage of aerodynamic efficiency, purity of form and racing spirit. 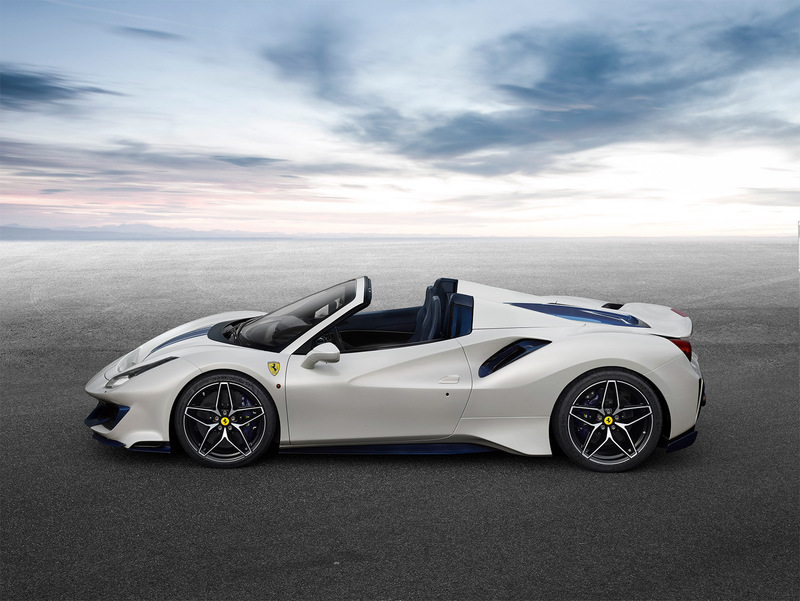 The car features new diamond-finish 20” alloy wheels with a novel 10-spoke star-effect interpretation of Ferrari’s traditional mid-rear engine berlinetta-style rims. Also available are the optional one-piece carbon-fibre wheels which offer a 20% weight reduction over the standard forged alloys. The philosophy that imposed an uncompromising choice of materials for the bodywork is also revisited in the interior, with weight being saved by the use of lightweight, pared-back components. As well as the generous use of carbon-fibre and Alcantara throughout, the carpets have been replaced by patterned aluminium footplates and the driver’s-side door handle is now a simple strap. The vehicle dynamics honed for this Special Series 8-cylinder convertible deliver a seamless combination of razor-sharp acceleration, braking efficiency, lightning-fast gear shifting, precision steering, grip, stability and superb handling. 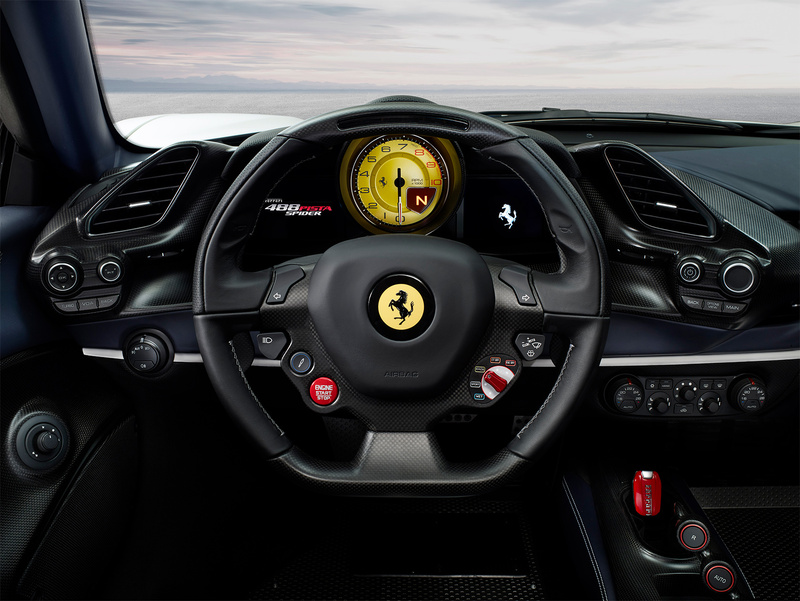 The result is an unprecedented driving experience. 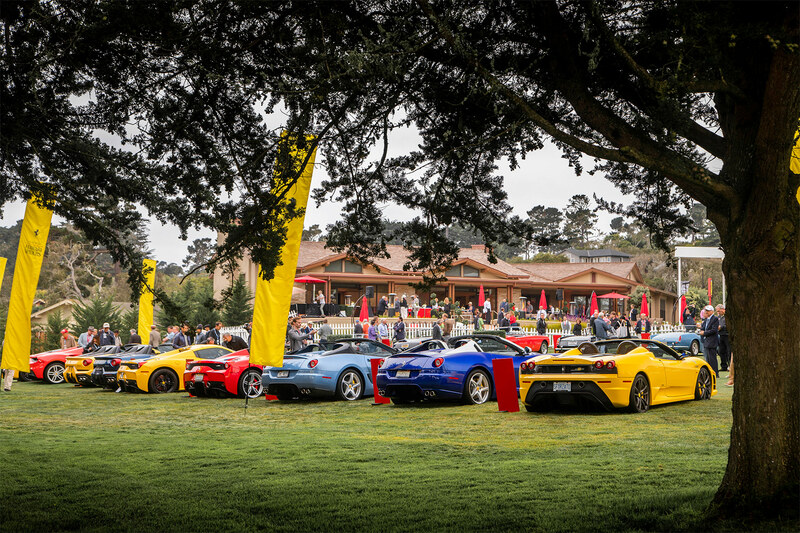 To celebrate Ferrari’s 50th convertible, a concours of Ferrari Spiders graced the first fairway. 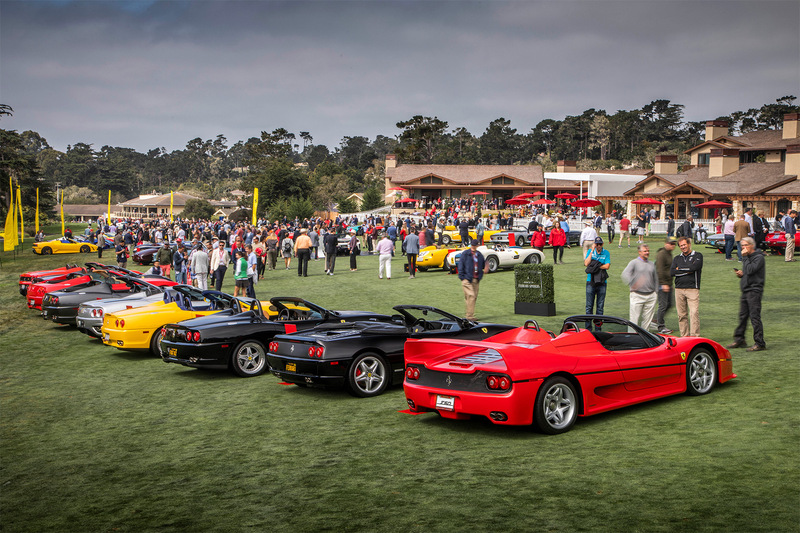 Fittingly, 50 examples of past drop-top models, all Ferrari Classiche certified, were assembled on the lawn as a show of the exceptional lineage of the newest model. 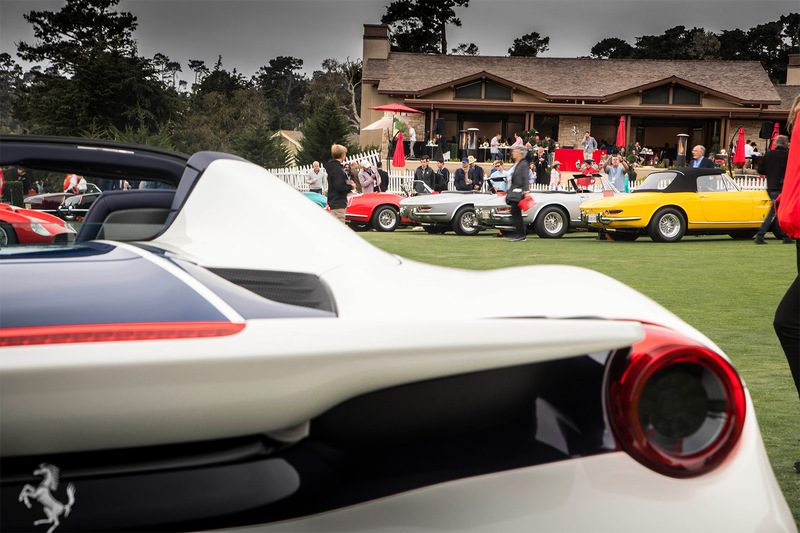 Among them were a 212 Export, 250 Monza, 335 S, 250 Testa Rossa, 412 S, no less than four 275 GTS4 NART Spiders, 250 California, F50, F60America, LaFerrari Aperta, to name a few.